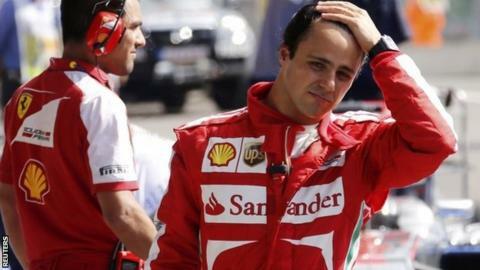 Ferrari want to retain Felipe Massa for next season, but only if he starts to deliver better results on track. The Brazilian's contract expires at the end of the season and a poor run of form has raised questions about his future at the team. But Ferrari team principal Stefano Domenicali said: "My favourite choice would be, of course, to keep Felipe. "When you look around there are not so many drivers out there that you swap and they immediately deliver." He added: "Felipe is a very good guy - very dedicated to the team. "But, of course, we need good results from Felipe, so that's why we will not rush as we have to make the right decision for the team." Massa, 32, has not won a race since 2008 when he looked to have won the World Championship having taken victory at the Brazilian Grand Prix, only for Lewis Hamilton to gain a position on the final corner and take the championship by a single point. Since then, he has scored eight podiums in a little over three and a half seasons. In the same period, Ferrari team-mate Fernando Alonso has managed 39, 11 of those victories. The 32-year-old ended last season strongly, having considered quitting the sport during an early season slump before signing a new one-year deal, and continued that form in the early part of this year. But following two crashes in Monaco - both at the same corner - his form has tailed off and he has scored just 67 points to his team-mate's 151. Kimi Raikkonen has been linked with Ferrari, BBC F1 chief analyst Eddie Jordan saying the Finn wants a return to the team with which he won the 2007 title. Speaking to the official F1 website, Domenicali said: "Kimi is a very fast driver and everybody knows how I rate him. But if I make a comment now, it will be taken as a direct answer. "There is no rush and we will make the right decision in the right moment."